People walk to the ferry heading toward Senegal in Gambia's capital, Banjul, Jan. 17, 2017. Gambia's President Yahya Jammeh declared a state of emergency just two days before he is supposed to cede power after losing elections last month to Adama Barrow. Gambian President Yahya Jammeh declared a state of emergency Tuesday after refusing to hand over power to opposition leader Adama Barrow, who won the country's presidential election December 1. In a broadcast on state-run TV, Jammeh said the public emergency would last until the Supreme Court ruled on a complaint his political party filed a week after the election, citing voting irregularities. Jammeh had said earlier that the date set for the transfer of power "is not cast in stone, as we have an injunction in the court and we have a problem with our elections." The president's announcement came as the opposition coalition warned that any Gambian security force member who didn't switch allegiance to Barrow upon the expiration of Jammeh's term Thursday would be considered a "rebel." Jammeh, in power since a 1994 coup, has become isolated at home and abroad since refusing to accept last month's election defeat. Gambia's ministers of finance, foreign affairs, trade and the environment resigned from his government, state television said Tuesday, as regional forces prepared to oust the veteran leader if he refused to step down this week. Also, the United Nations and several African leaders have asked Jammeh to step down peacefully. "I think the declaration of state of emergency is a very grave situation. It takes away some of the hopes that many of us had, that many Gambians had," former Greenpeace Executive Director Kumi Naidoo told VOA. Naidoo, who just spent three days in Gambia, is now launch director of Africans Rising for Justice, Peace and Dignity, a civil society movement based in Johannesburg. "There is a high level of fear and panic," Naidoo said, noting that as many as 8,000 people had left the country already. He also noted that residents were migrating to rural areas within Gambia, fearing that if violence occurs, it will be worst within the cities. FILE - Gambia's President Yahya Jammeh attends a rally in Banjul, Nov. 29, 2016. The tension, Naidoo said, has affected schools, teachers, the health system, local businesses and the media. "Yesterday, while we were leaving Gambia, our plane was delayed by about two hours because 10 journalists from around the world were denied entry," he said. "The media environment is extremely constrained, with some radio stations just playing music and there is no other programming." U.S. State Department spokesman John Kirby said in Washington that Jammeh was losing opportunities to respect the will of the Gambian people. "Doing so will allow him to leave office with his head held high and to protect the Gambian people from potential chaos," Kirby said Tuesday at a briefing. "Failure to do so will put his legacy, and more importantly the Gambia, in peril, and we've been very clear about this." Halifa Sallah, opposition coalition spokesman, denied rumors that Barrow, a resident of neighboring Senegal, could be sworn in at the Gambian Embassy. Sallah insisted that Barrow would be sworn in on Gambian soil. 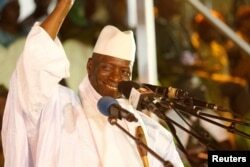 Earlier this month, Gambia's army chief reaffirmed his support for Jammeh in a letter published in a pro-government newspaper. However, West African regional bloc ECOWAS has placed its military force on standby, ready to act if Jammeh does not step down on January 19.